Rachel, Nevada – Population: Humans YES…Aliens ? 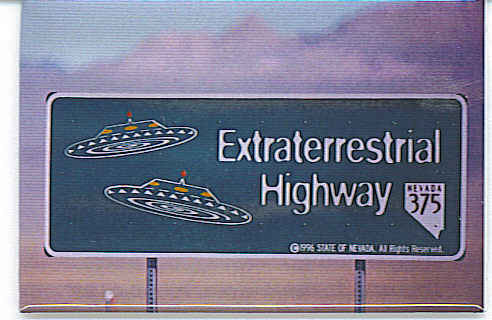 Those words are seen on a sign as you enter the town of Rachel, which has been named the “UFO Capital of the World” due to its closeness to the top secret Air Force test facility Area 51, and claims of numerous UFO sightings. Route 375, The Extraterrestrial Highway, meanders across the desert of Nevada and North of Area 51. Visitors must be cautious as this is open range and cattle frequently cross the highway, or might just be standing in the middle of the road. This is another lonesome highway where strange lights often appear in the night sky, and you have the feeling of being in the middle of nowhere. After the nearly hundred mile drive across the desert from Las Vegas, the Restaurant called Little A’Le’Inn is a welcome sight. This is the friendliest group of people and all are willing to discuss the various sightings and events in their area. While waiting for my World Famous Alien Burger, took time to look around inside at their Mini Museum. No surprise that there would be a gift shop with many Alien and Extraterrestrial Highway items available as well as a wall covered with UFO photos from all over the world. Directions were freely given to the border of Area 51, but was warned to stay back from the fence, or a guard would appear very quickly as the area is securely monitored. Did drive back through the desert roads about nine miles, until a couple signs said: Warning Restricted Area and Warning Military Installation, which seemed an appropriate place to halt that journey. Could see the dust of an approaching vehicle so headed back toward Rachel. Headed out as darkness was starting to fall and certainly hated to see the day come to an end. The friendly locals suggested I watch for a mailbox along the road as I was leaving. 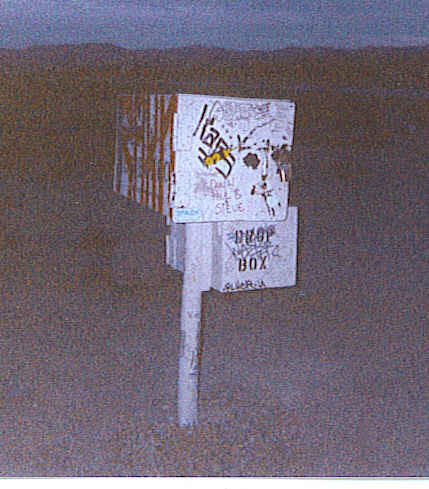 Just down the road was the famous “Black Mail Box”, now painted white, where people sign their names at the spot where UFO watching is a frequent activity. Leaves many questions to be answered to those skeptical about UFOs. Why do so many people come to the Black Box area? Is there life on other planets? Do aliens from other galaxies dwell among us? These are all questions still pondered while drinking my morning tea from a Little A’Le’Inn mug.